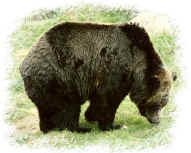 The Brown/Grizzly Bear has the most widespread distribution throughout the world of any of the eight bear species. They are found throughout most of the northern hemisphere including North America and Eurasia. Preferred habitat includes mountain forest, open meadows and large river valleys. The brown/grizzly bear originally ranged from the northern arctic seacoasts southward over the tundra-covered mountains of the north, throughout the boreal forests and as far south as Mexico on the North American continent and as far south as Spain, Italy and Iran in Eurasia. The southern limits of their range coincided with the end of travel corridors of preferred mountain forest habitat. The Japanese island of Hokkaido also has a population of brown/grizzly bears. It is estimated that there are currently somewhere between 125,000 and 150,000 brown/grizzly bears throughout the world. 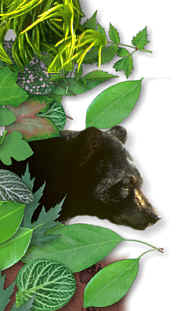 The adult bear is generally 3 1/2 feet tall when on all fours; is 6 1/2 to 7 feet in length; weighs 330 to 825 pounds. Males within a specific geographic area may weigh more than twice as much as females. These bears are covered with a heavy shaggy fur with many color phases including black, cinnamon, red, blond or a mixture of these colors. The name “grizzly” comes from the silver tipped grizzled hairs that these brown bears develop as they get older. Brown bears have a heavy stout body with strong muscular legs. They have a big head, short tail, small rounded ears, plantigrade feet and a hind foot with five toes. They have a distinctive muscular shoulder hump and their front claws are long and highly adapted to digging for food (eg., tubers, rodents, etc.) as opposed to climbing. They are very quick and are able to attain speeds of up to 35 miles per hour for a short distance. They are also very capable swimmers. Being a seeker of foods which return the highest nutritional and protein value for the least expenditure of energy the brown bear’s diet usually consists of more than 75% of vegetable matter that includes berries, flowers, grasses and sedges, herbs, tubers, corms and roots (hence the specialized development of their claws and shoulders for digging). The balance of its diet is supplemented with animal matter such as decaying animal carcasses, fish, small marine animals, ants and other insects, honey, elk and moose calves and a variety of other small mammals such as ground squirrels and marmots. During the late summer and early fall all bears have an imperative need to gain as much weight as possible as the hibernation period nears. At this time the brown bear will normally make very large weight gains and may forage around the clock with only short rest periods. With the arrival of cold weather and/or snow the bear will undergo a metabolic transformation as it prepares for hibernation, the energy-saving process bears have developed to allow them to survive long periods when there is insufficient food available to maintain their body mass. As they stop eating and become lethargic they will enter a cave; dig out a den; hole up in a dense brush pile, hollow log or tree cavity. While hibernating a bear’s heart rate drops from between forty to seventy beats per minute to only eight to twelve beats per minute and its metabolism slows down by half. Female brown bears normally mature in their fifth year. Mating normally occurs between late May and early July. Females will normally mate with a number of males over the approximate three weeks of the breeding season. After mating a process referred to as delayed implantation takes place. The fertilized ovum divides a few times and then floats free within the uterus for about six months with its development arrested. Sometime around the denning period the embryo will attach itself to the uterine wall and after a period of eight weeks the cubs will be born while the mother is still in hibernation. The delayed implantation process insures that the mother bear has enough fat reserves to carry her through the winter and if that is not the case the embryo will not implant but is simply reabsorbed by her body. Females will normally breed every three years. The number of cubs born varies from one to four with two to three cubs being average. At birth the cubs are blind, toothless, hairless and very tiny. They weigh from 21 to 25 ounces. Within the next several weeks the cubs will develop rapidly while nursing on their mother’s calorie rich milk and will be able to follow their mother when she leaves the den. The life span of brown bears in the wild can be 25 years or more. As many as 100,000 grizzlies once ranged from the Missouri River to the Pacific Ocean and from Canada to central Mexico, occupying plains, forests, mountains, beaches and wetlands. Fewer than 1,000 grizzlies exist today in the contiguous 48 states, in areas representing less than 1% of their former range. Grizzly bears currently inhabit five or six areas in Montana, Wyoming, Idaho and Washington. 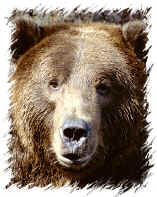 In 1975 the grizzly was listed as threatened-the first animal protected under the Endangered Species Act of 1973. “Recover” means actively protecting bears and their critical habitat and taking other steps so populations become viable, self-sustaining and no longer in need of ESA protection. Since grizzlies are listed as threatened, federal and state agencies work to “recover” grizzly bear populations in the lower 48 states. 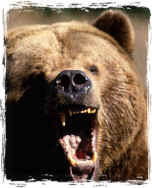 Grizzly bears range widely, usually avoid people and live in rugged and remote areas, making it difficult to count them. Because grizzlies are “threatened” under the Endangered Species Act, their population size and trend are important to wildlife managers. Knowing the population status helps biologists make decisions on matters affecting grizzly bears and assess effects of past management actions. Traditional techniques to estimate grizzly bear numbers – aerial surveys, trapping and marking bears and ground surveys – are expensive and intrusive.